Allison Maslan International (AMI) has been a client of ours for several years. Allison hosts two business events every year: The Blast-Off Business Breakthrough, which is attended by about 500 entrepreneurs, and the CEO Success Network Retreat, a smaller event geared towards more advanced business owners. Because of the many returning attendees, Allison is always in need of new and trendy giveaways to make each event stand out. 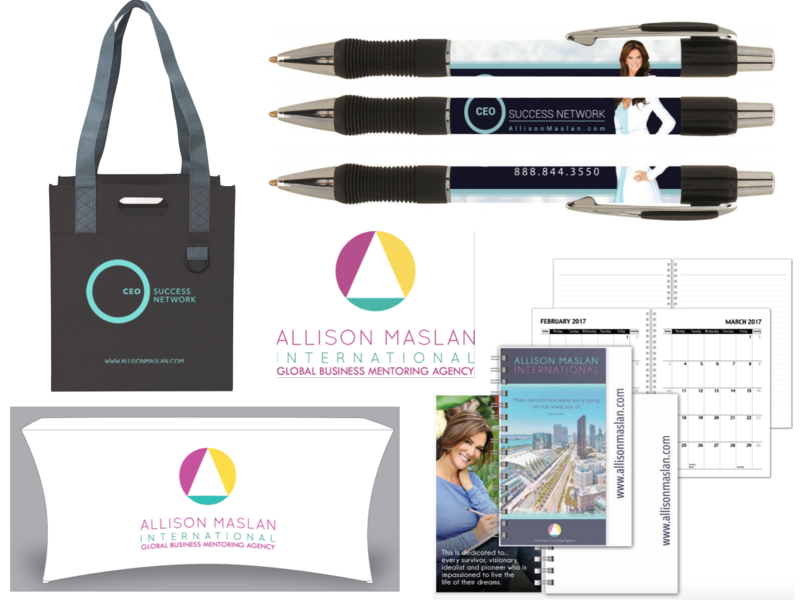 Year after year, we have created a variety of branded tote bags, full-color pens, journal notebooks, lanyards, chocolate candies and other items that Allison gives out to the attendees of her events. We also create the table cloths for the events, and stand by to fill any other promotional products that Allison might have. We are truly honored to be a part of Allison's outstanding events every year, and we look forward to continue working with her in the future! "Wearable Imaging is the only company I will use for my promotional products. I lead many events year after year, and Wearable Imaging always makes sure I stand out with the most unique and in-demand items. Wearable Imaging strategizes with me to design products that are the perfect fit for my target market. They are so creative with every project, whether it be apparel for my team, the latest high-tech gadgets, mugs, pens, notepads, gift items, and more. They get the job done right, their items are stunning, and they even beat their deadlines. That is almost unheard of! I can't say enough about Robin ahd the Wearable Imaging team!"